Week FIVE and a half, how did you sneak up on me?!! 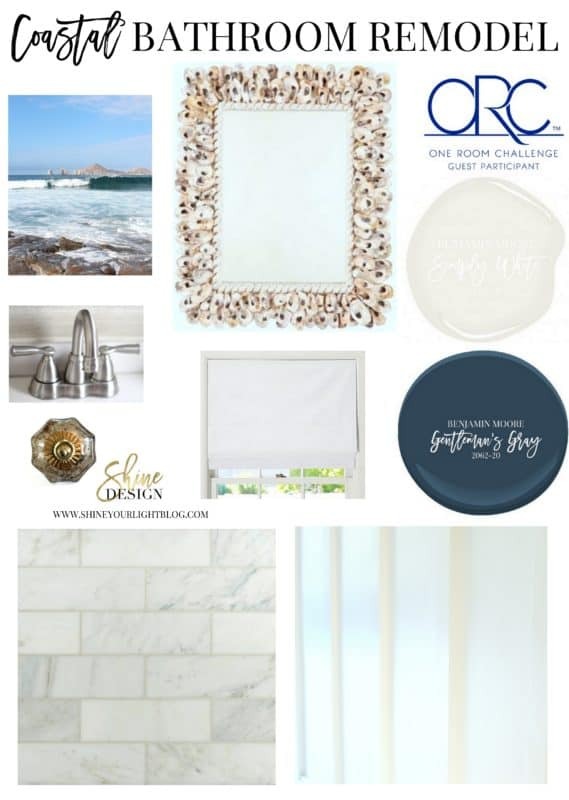 My vision for the bathroom renovation is finally starting to emerge and after 7 years of living in this house, it’s really exciting to bring some of these daydreams I had for our spaces – like adding some character with moulding – to life. 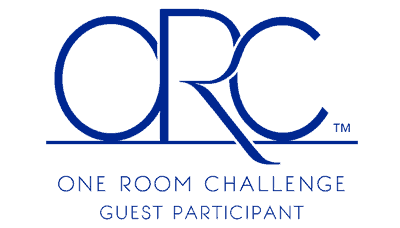 Here’s a progress report as we near the finish line of the One Room Challenge. 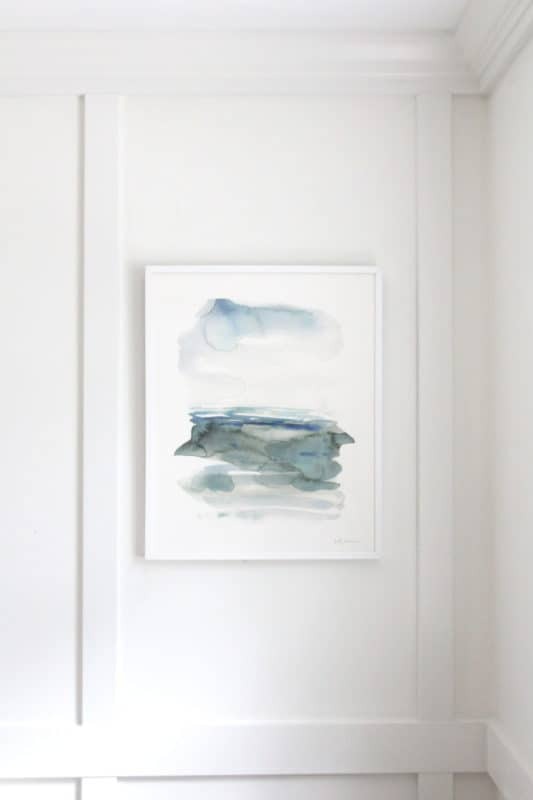 A few weeks ago I talked about some beautiful coastal art options I was mulling over. This week the piece arrived! I went with the “Ocean Landscape” watercolor print by Kelly Witmer and I absolutely adore it!! Who invented caulking? Whoever you are, you are my favorite person on the planet. You are my hero. I love you. This week I caulked and puttied and caulked some more, then painted all the new moulding in semi-gloss. 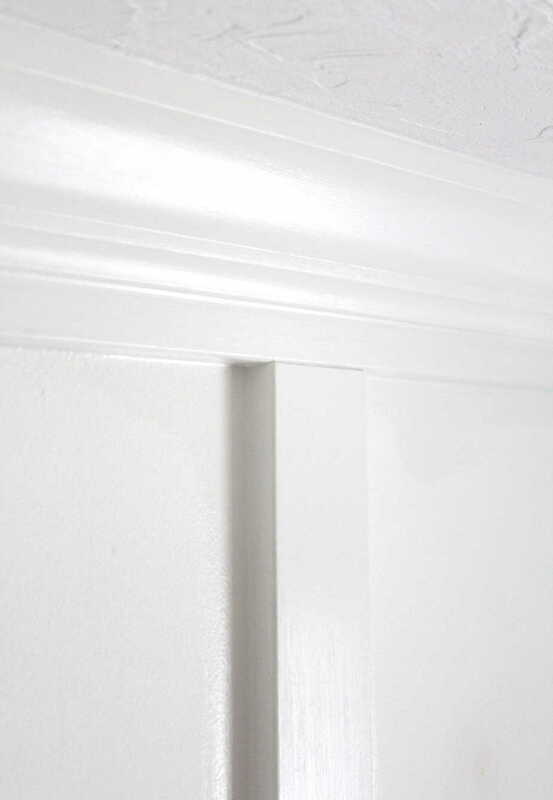 It never ceases to amaze me the difference caulking makes in the finished product – and also how much character moulding adds to a space. This week I struggled a bit with the paint finish. 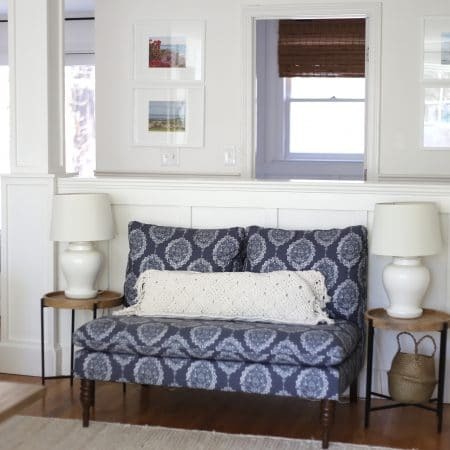 You know how typically wainscoting (a chair rail and below) is painted semi-gloss? Well, what finish to do when the moulding is on the whole wall? I was planning to do semi-gloss everywhere, but the issue with that is semi-gloss (and gloss) shows every little flaw, and this room’s walls are less than perfect. Ultimately I decided to go semi-gloss on the moulding and then paint the “boxes” in eggshell. Meaning more work but less calling attention to the imperfections in the room. In other renovation news, this very exciting delivery arrived! 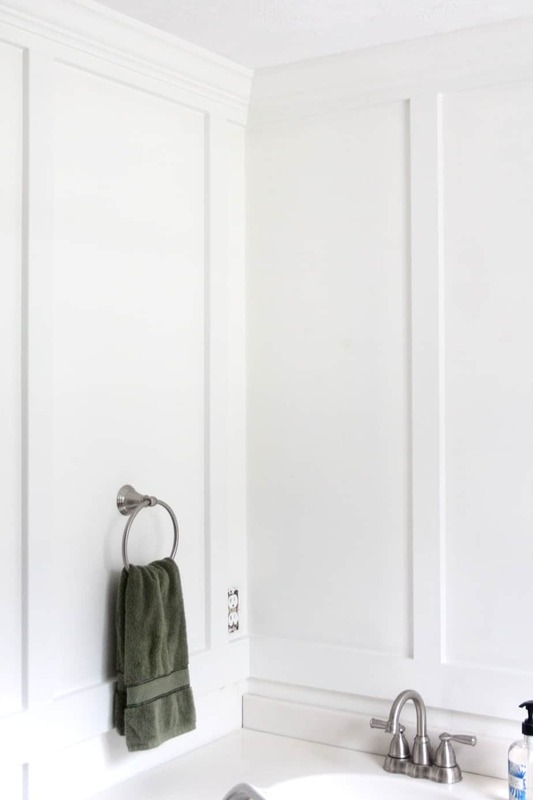 The toilet seriously might be my favorite part of this makeover because 1 – it’s white! (we have all almond/bisque bathroom fixtures in this house and they’re not my favorite) and 2 – it’s self cleaning!!!! It’s wishful thinking that I’ll never have to clean a toilet again, but reducing how often it needs to be done sounds great to me! The big project I was hoping to tackle this week was the flooring, but unfortunately the arrival of my tile has been delayed significantly. I’m doubtful it will arrive by the end of the One Room Challenge, which is a huge bummer. Since I can’t control that situation, I obsessed about the little details instead! 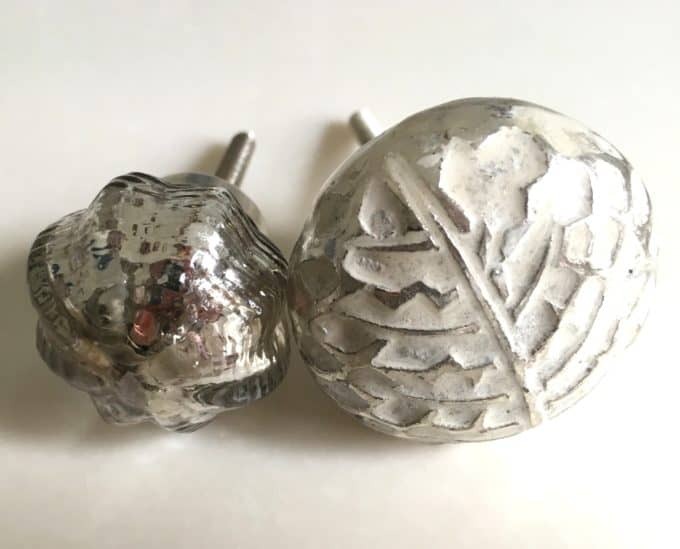 7 sets later, I finally landed on these affordable small mercury glass fluted knobs from World Market (which I just noticed are on sale online and cheaper than I paid in the store). They are perfect with the deep blue and give this white space a little sparkle and shine. The 30+ year old oak vanity is going to get some love this week – filling in of holes, a major sanding, and then finish paint, followed by new hidden hinges and the pretty knobs. More on how to spruce up an old vanity, and why I decided to keep our existing one and the countertop, coming up soon. World Market is new to my little corner of the universe and it was so much fun to traipse through and check out everything in person that I ogle at online. 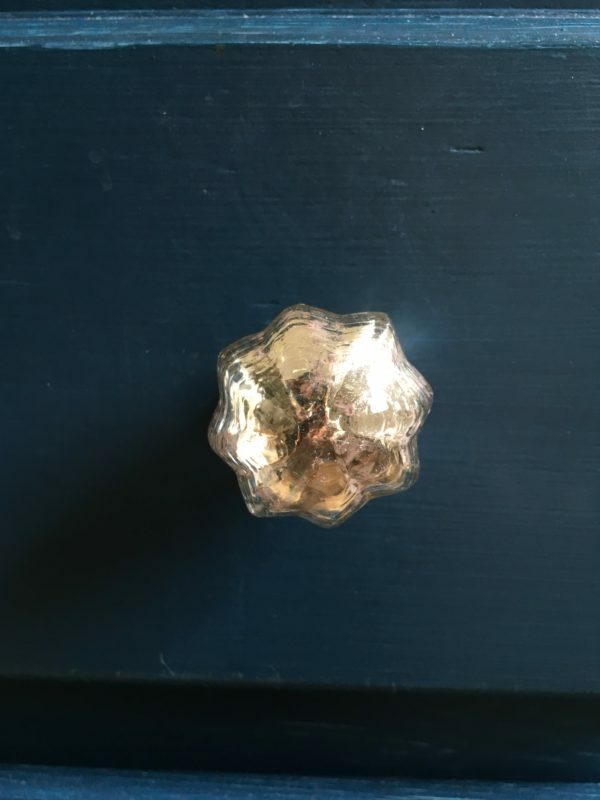 One of the knobs I bought to try on the vanity was the matte silver brass knob on the right, which I thought was so pretty but kind of ginormous for a cabinet. Look how much bigger it is than the small fluted one. 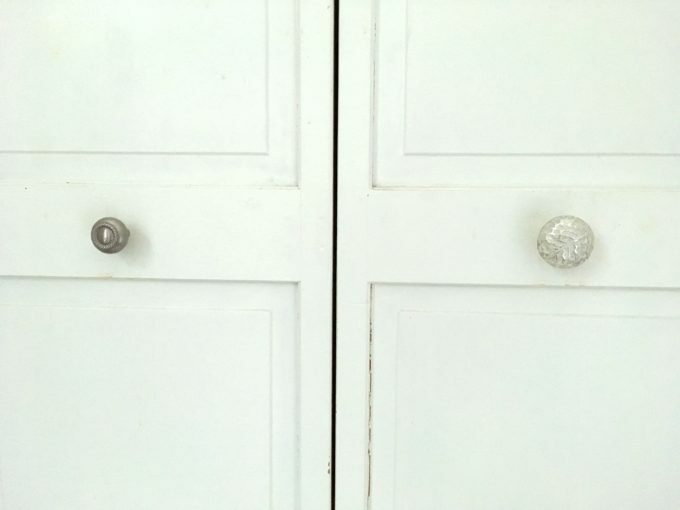 The knobs on the bi-fold doors enclosing the washer and dryer seemed ridiculously small, so I tried the big knobs there and they are perfect….not too big like a regular door knob, but not too small like what I had originally. 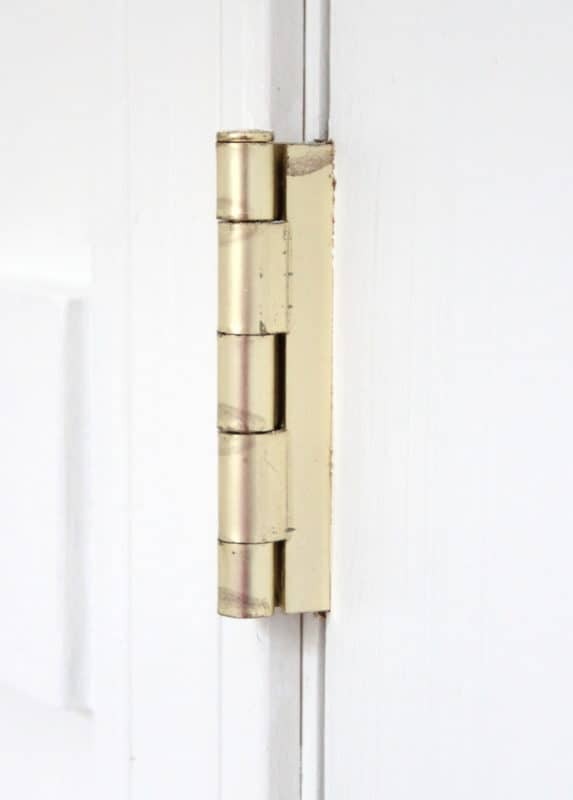 The bi-fold doors take up an entire wall, so I love this pretty little detail over there. However, now that I’ve turned my attention to these doors, I’m woefully aware of the fact that they need to be caulked and repainted. Soooooo……adding that to the last week’s to-do list!! In two of the moulding “boxes” I had planned to use some of our beach photos in square frames, but like the knobs, I’m having a Goldilocks moment of too big (Ikea’s 19″x19″ Ribbas) and too small (these 12″x12″ones from Target). The race is on to find just the right ones. Hope, dream, pray that my floor tile magically arrives in the next day or two. Ummmm, that little project called the oyster shell mirror???? 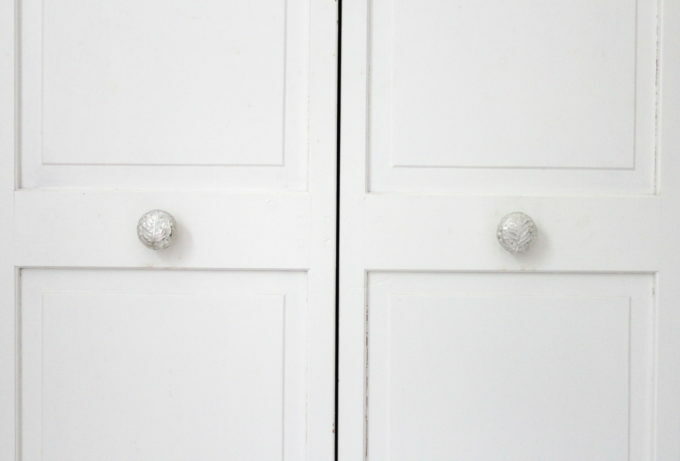 Patch, caulk, paint the vanity and add new hinges and knobs. Caulk & paint the bi-fold doors. 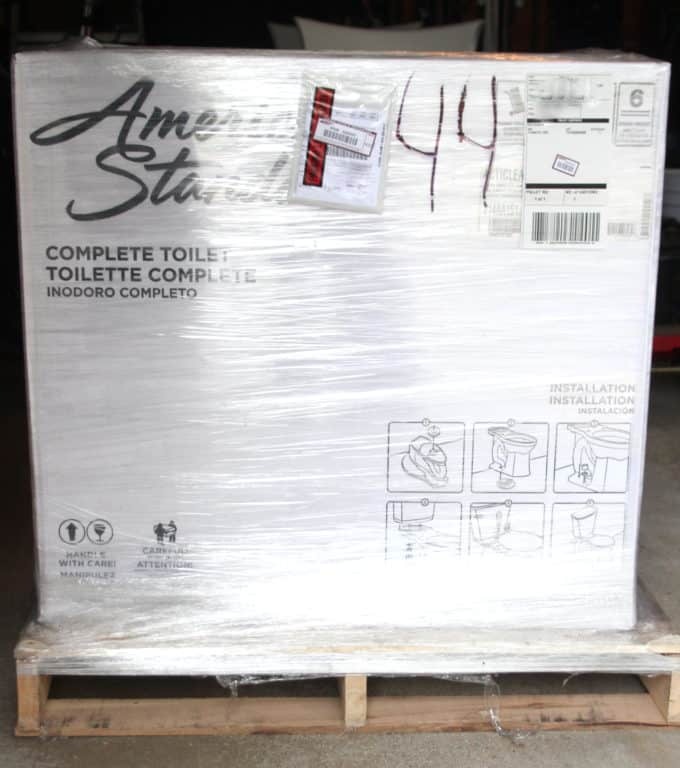 Install the glorious new toilet. Find the perfect square frames. I can’t wait to see everyone’s reveals this week! There are so many amazing projects being tackled for this 6 week challenge and it’s fun to watch it all transpire. Thanks so much to Linda at Calling It Home for creating and orchestrating this bi-annual event, with media sponsor House Beautiful! 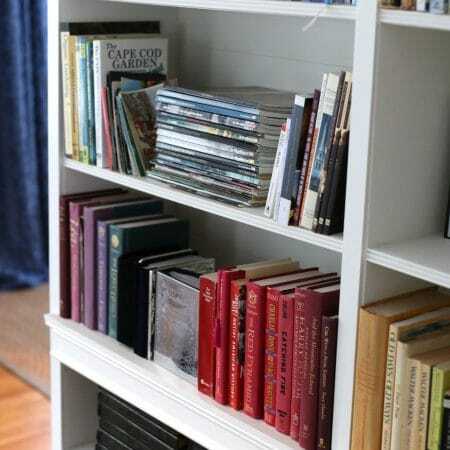 Check out all the One Room Challenge projects here! I’m looking forward to sharing how this little bathroom turns out with all of you, thanks for following along! looking so good, lisa! i have some caulking on my stairwell to do but that will be a post- ORC project i think. ugh. It’s looking great Lisa! Can’t wait to see the reveal!! With or without tile I know it will be an awesome transformation! 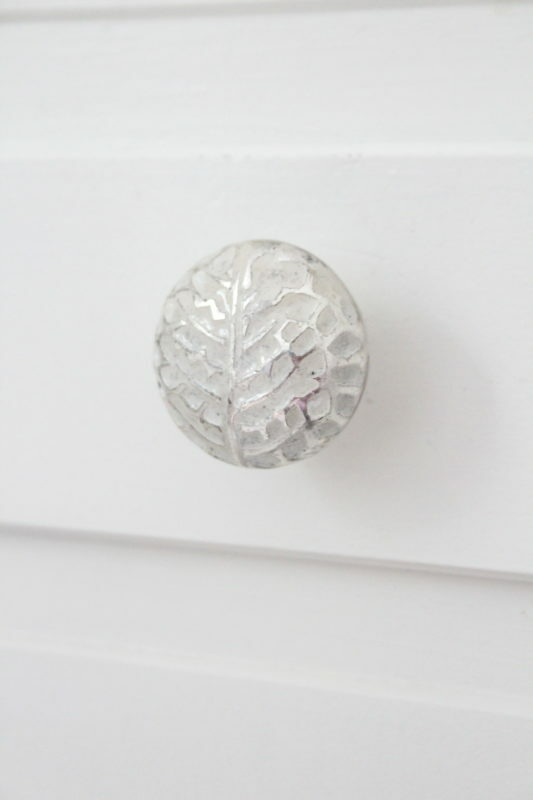 Love those knobs! Can’t wait to see the finished bathroom, you’ve done so much already!! Those walls look amazing!!! I can also appreciate your love and excitement over new toilets 😀 Super awesome on the self cleaning feature! 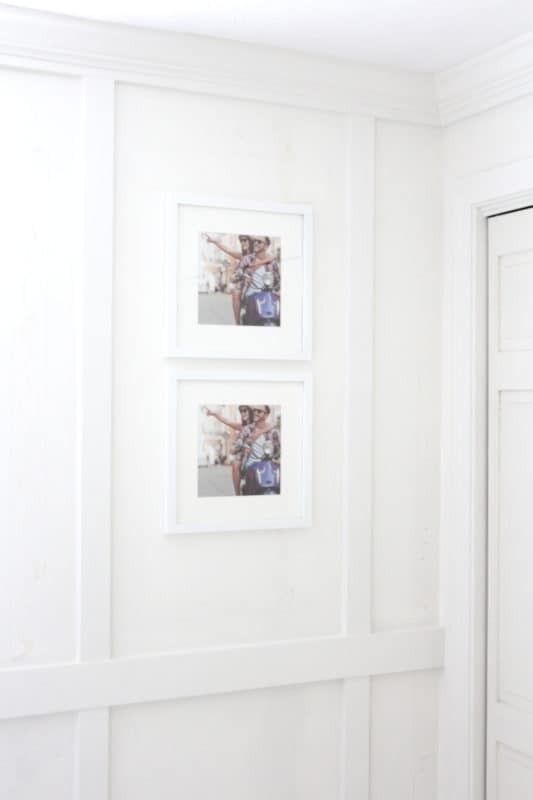 I adore your walls…and self cleaning toilet? Woo Hoo can I have one installed at my 94 year old dad’s place?!! That is so irritating about the tile. I will look forward to the final reveal! This is very exciting. Your walls are gorgeous. Thanks Mary Ann! I’m so happy to have it done, just waiting for some sunshine so I can photograph it! Nancy you are so sweet!!! I’m waiting for some sunshine to photograph the room but it’s pretty much done and I’m so happy I tackled it! Thank you so, so much for all the love my very kind friend!!!!! Your walls are awesome. I am looking forward to see the final results. Just catching up on the ORC and I’m hoping by the time you read this that your tile has arrived. Love the makeovers you do and I’m looking forward to the reveal. Brenda thanks so much for stopping by and for your kind words. The tile is all done and I love it so it was worth the wait and headache 🙂 Hopefully by the end of this week I’ll have the reveal up, if the sun ever comes out so I can take some decent pictures!